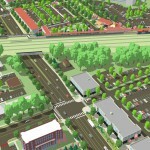 In 2014, Houseal Lavigne Associates was hired by Richton Park, IL to prepare visualizations for the Town Center Area, designed to support the Village’s submittal for an RTA grant related to the Metra Station Area Plan and surrounding improvements. 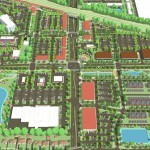 Rather than establishing guidelines or recommendations for the area, HLA was asked to prepare visualizations based on numerous existing plans and studies, including, among others, the Town Center Streetscape Manual, Town Center and Station Area Plan, Town Center Stormwater Master Plan, Greenway Plan, and Richton Park Design Guidelines. 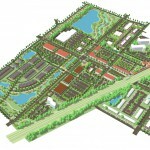 Coordinating existing plans, staff comments, and best management practices, HLA prepared a 3D model for over 160 acres of land comprising the Town Center Area. 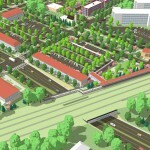 Developed using various 3D modeling software, the model included streetscape and pedestrian improvements; façade improvements to existing buildings; visualizations of potential investment per existing plans and regulations; and various beautification elements. 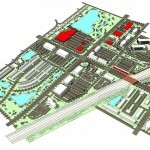 At its foundation, the visualization was prepared not just to support redevelopment and investment within the Town Center and Station Area, but to unify a number of diverse plans and studies into a single, consolidated graphic that demonstrates the cooperation of planning efforts within Richton Park. 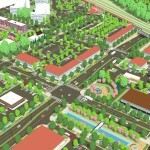 Excellent work, remind us about Sim City. Well done, we are so proud of you…….